Thread: Ryzen ES benchmarks leaked by French magazine!! So in gaming it is 10% slower than a Core i7 6900K and 8% in non-gaming software. If they can get clockspeeds up and Turbo running properly,it might actually be not bad!! 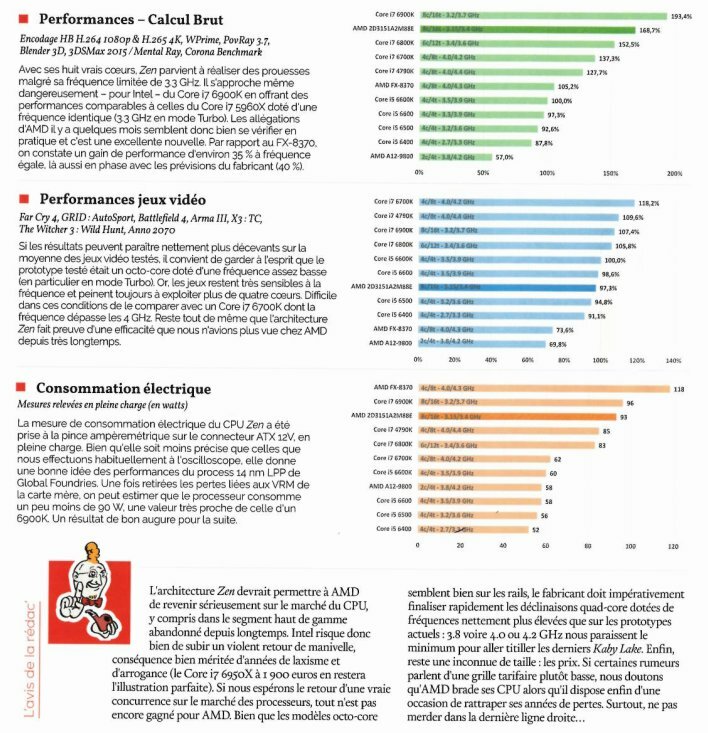 Re: Ryzen ES benchmarks leaked by French magazine!! Even as an engineering sample it seems faster across the board than the 8370. So finally some progress. Well,if the chips were running at similar clockspeeds it looks like Core i7 6900K performance even in gaming whilst only using a dual channel memory controller. That indicates Broadwell level IPC and even power consumption is similar to Broadwell on a worse 14NM process AFAIK. Some of the games tested also perform terribad on AMD CPUs - ARMA III being one of them as it basically only uses one to two threads intensively. The real game-changer will be the advanced Turbo feature. He runs one of the Italian tech sites and has been reasonably accurate on rumours in the past. AMD did not have Turbo running during their preview. Last edited by CAT-THE-FIFTH; 23-12-2016 at 07:02 PM. He was asked in twitch chat:" Got your hands on AM4 yet?" Answer:" Yes. Obviously - I can't tell you to much, but from a price/performance point of view it is really good. I can recommend what Zen will bring." The chap is really well known in the overclocking scene,was the chap which unlocked the RX460 and works for Caseking too. Looks promising but when its retail and we know the actual price and have more benchmarks from several sources. Hopefully it will make Intel pull their finger out and get the cpu wars going again!